It’s time for a change. I was never a scout but am still a firm believer in the “always be prepared” motto and consider myself an earlier adopter of new tech when available. 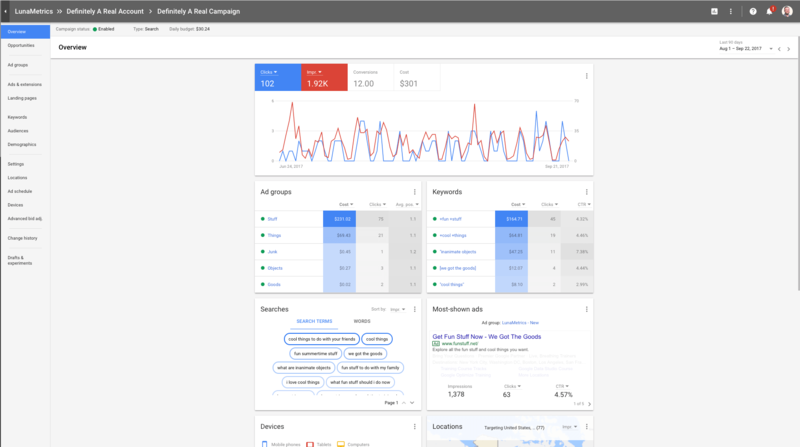 I have been working in the same Google AdWords interface for the past ten years and it is refreshing to see the UI get a facelift with Google’s Material Design. 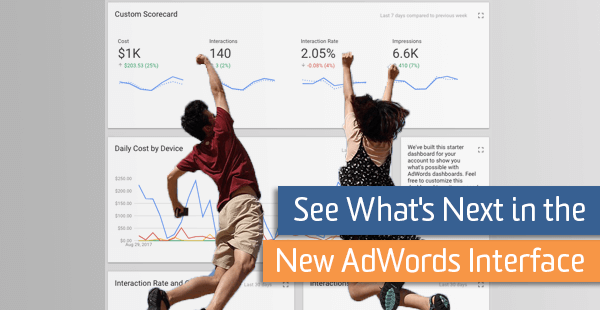 You should be eager to jump in and familiarize yourself with the latest hotness that is AdWords Next. …or in your account settings found by clicking on the gear icon. After you’ve entered the beta UI the very first thing you will notice is how clean everything looks. The vast majority of your most-used navigation and reporting features are upfront and personal. Familiar reports and tools have been shuffled around so it’s easy to get lost at first. Let’s take a look around. Once you give it a shot, I am sure that you will find the new design far more intuitive than its predecessor. It’s not the sexiest topic but worth reviewing for anyone new to digital marketing tools. The familiar tabbed layout of the old UI has been replaced with a more streamlined approach. All of these tabs across the top, within the primary panels and even tabs within tabs. Those days are gone and have been replaced with more intuitive design in the left-hand navigation pane containing a campaign selector and a reporting selector. Just select the campaign filter or individual campaign from the black menu, then select the reporting view – overview, campaigns, keywords, ads & extensions, locations, etc. – from the gray menu. No more searching the screen to find the features you need. Having these menus in close proximity and presented in a list form helps get you where you want faster. The most important change in the navigation menus also affects the way we select targeting. Targeting criteria across campaigns types is now consolidated. No more digging to find that certain targeting element you need to incorporate into your campaign optimizations. I love this and you should, too. Notice in the screenshot above that audiences, demographics, placements, topics, and dynamic ad targets are all immediately available right here in the primary navigation. Nothing is buried anymore. Everything you need is immediately in your face. Now, keep in mind that only targeting features for the campaigns you have in your account will be visible. This is another great step the AdWords team took here: Only show advertisers features that are relevant to their account. The old way was messy and cluttered. For example, if you wanted to edit your display campaigns, you needed to navigate to the “Display” tab then drill down several levels just find the data you were looking for let alone make the necessary edits to your campaign. Planning, sharing, and measurement configuration have typically been a hassle to do quickly. 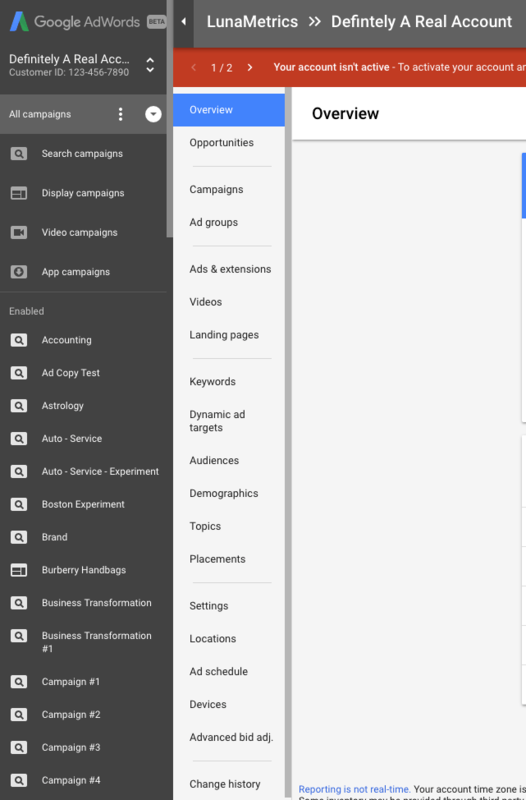 Another UI update combines all of the ancillary tools and features of Google AdWords into a single location for ease of use. Research tools, conversion tracking, bulk editing and automation, and general account setup can all now be found under the stoplight menu (3-dots) near your login name in the top-right of the screen. I won’t even take the time to show you the old way because these items were previously scattered all throughout different areas of the old AdWords interface. Now, having them all in one place, makes life so much sweeter for new and old account manager alike. 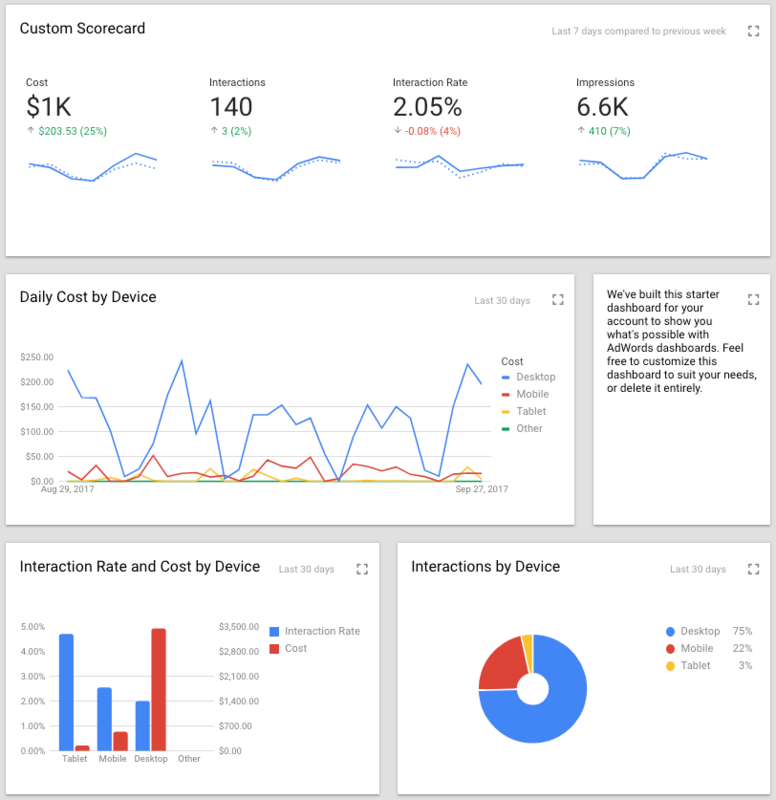 The reports in the next rendition of the AdWords UI are fantastic. Big. Bold. Interactive. They give you the information you want, fast. Here we have high-level information that is more meaningful to account managers. 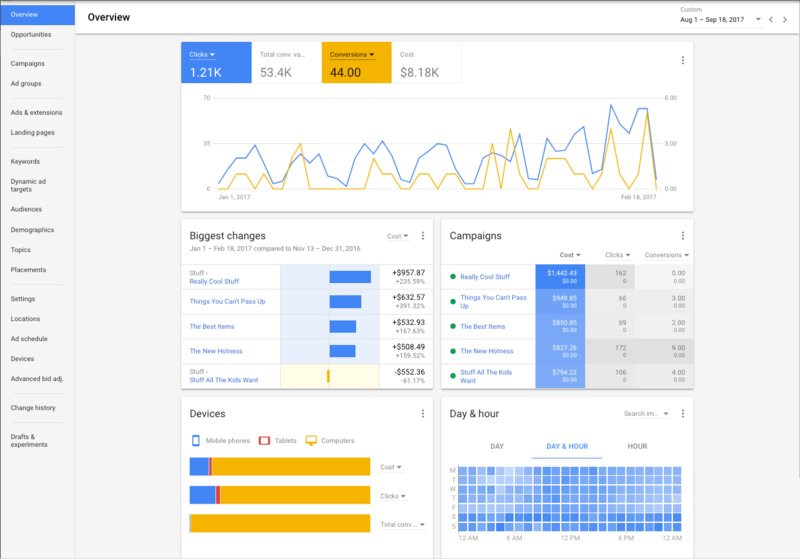 This summary report shows your overall account traffic and conversion trends while providing insights into campaigns, device, ad scheduling, and more. Insights are immediately visible and actionable. The next example is an overview of a single campaign. Here you are given a high-level view of the campaign performance along with search terms presented as a word cloud, visibility into your best-performing ads as well as device and location details. 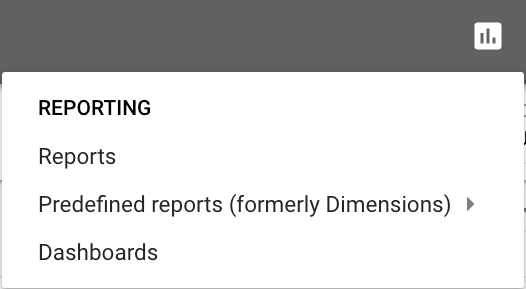 While you should already be aware of the Reports and Predefined reports (formerly dimensions), a great new addition comes in the form of the new Dashboards feature. Dashboards allow you to easily save reports and only show the information you care to see – a great feature for reporting to the C-suite. We also have a brand new report for gathering insight on landing page performance. Previously there was a Final URL report but it was buried in the dimensions reports. This one is front and center and provides some new insights as well. Notice that the first metrics provided are intended to give insight into the mobile performance of your site as it pertains to AdWords. Speed is everything when it comes to mobile. Mobile-friendly click rate and Valid AMP click rate show the percentage of clicks arriving on those types of pages. If you are behind the times and haven’t upgraded your mobile performance, this report will provide invaluable information as to how those changes might impact your SEM. I’ve been saving the best for last… new targeting and bidding features. Now, there have only been a few and I wouldn’t necessarily call these groundbreaking. Still, you should be aware and test incorporating them into your campaigns. Household income is now a demographic target alongside age and gender helping to refine audiences even further. You can use this target, like most others, to target, exclude, or modify your bids for the ad auction. For anyone valuing calls, AdWords now allows you to set an “advanced” bid adjustment for certain interaction types increasing or decreasing the likelihood that certain ad components, call extensions in this case, are visible. This comes as a nice feature for those that have always wanted to take more control of the visibility of their ad extensions. Notice above that we see columns for interaction type, bid adj. and interaction coverage which provide more insight into how bid adjustments affect interaction type visibility. Interaction coverage, for example, demonstrates how your bid adjustment impacts overall reach. Take a few walkthroughs of the new UI. Yes, it will take you some time to adapt but you’ll get used to it. After a while I think you’ll be pleasantly surprised just as I was. Better to handle all of those steps now before the AdWords product team eventually pulls the plug on you!